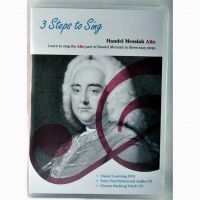 Contains a visual learning DVD, Voice Part Rehearsal CD, Chorus Backing Track CD and Instruction Guide - please order by 3pm for Same Day Despatch. The joy of using '3 Steps to Sing' is you just put the disc into your DVD player/Computer and start singing right away! You see the words and notes change colour exactly in time as the Handel Messiah Alto part is sung by a professional singer who is a real pleasure to hear – and you just join in! Listen for the Alto line and join in.